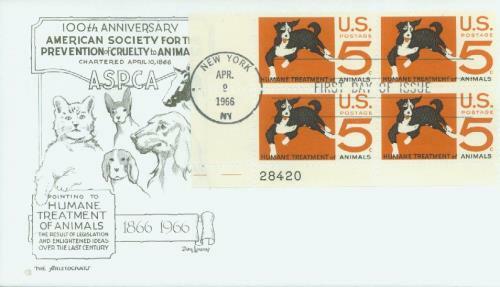 US #1307 was issued for the 100th anniversary of the ASPCA. Click image to order. 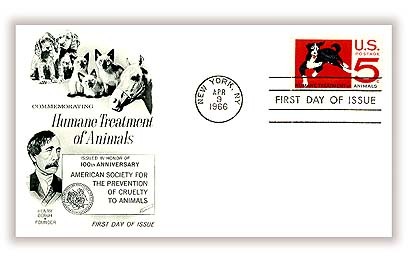 On April 10, 1866, Henry Bergh founded the American Society for the Prevention of Cruelty to Animals (ASPCA). Animals were regarded as property throughout history, and most laws served to protect people from them rather than prevent animal cruelty. While in Europe on a diplomatic mission, Bergh was distressed by the cruel treatment against animals that he witnessed. US #1307 – Fleetwood First Day Cover. Click image to order. On his return trip, Bergh passed through England where he met Lord Harrowby, the president of the Royal Society for the Prevention of Cruelty to Animals. Harrowby had a significant impact on Bergh and inspired him to dedicate his life to putting an end to animal cruelty. He resolved that he would not only create an organization to protect animals, but also that they would have the power to arrest and prosecute those that violated the law. US #1307 – Plate Block First Day Cover. Click image to order. US #4451-60 pictures animals adopted from shelters. Click image to order. Armed with the support of prominent dignitaries, Bergh lobbied the New York State Legislature to pass a law protecting animals. The charter given to incorporate the American Society for the Prevention of Cruelty to Animals was passed on April 10, 1866. Nine days later, New York State passed an anti-cruelty law and granted the ASPCA the authority to enforce it. 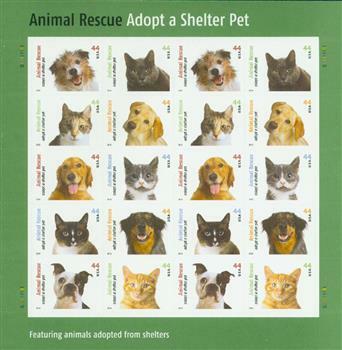 US #5106-25 – Set of 20 stamps honoring a variety of pets. Click image to order. 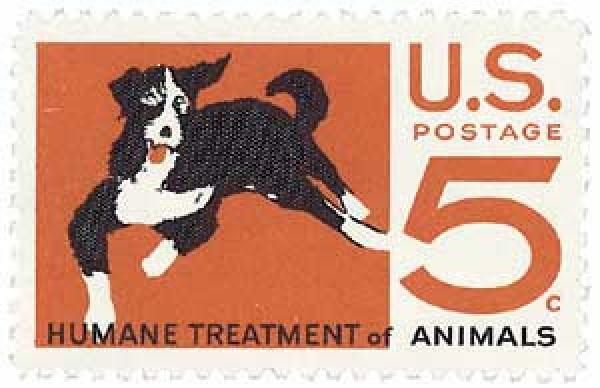 Bergh was very involved in the ASPCA’s work. He was often found in the streets and courtrooms fighting for animal welfare. He inspected slaughterhouses, helped the police close down dog and rat fighting pits, and spoke at schools and organization meetings. The society operated the first equestrian ambulance, developed a sling to rescue horses, and supplied fresh drinking water for Manhattan’s horses. By the time of Bergh’s death in 1888, 37 of 38 states in the Union had enacted anti-cruelty laws. In the early 1900s, the ASPCAs focus shifted more to small domestic animals such as dogs and cats. Today, the ASPCA focuses on sheltering abandoned animals, adoption programs, and spaying and neutering advocacy. 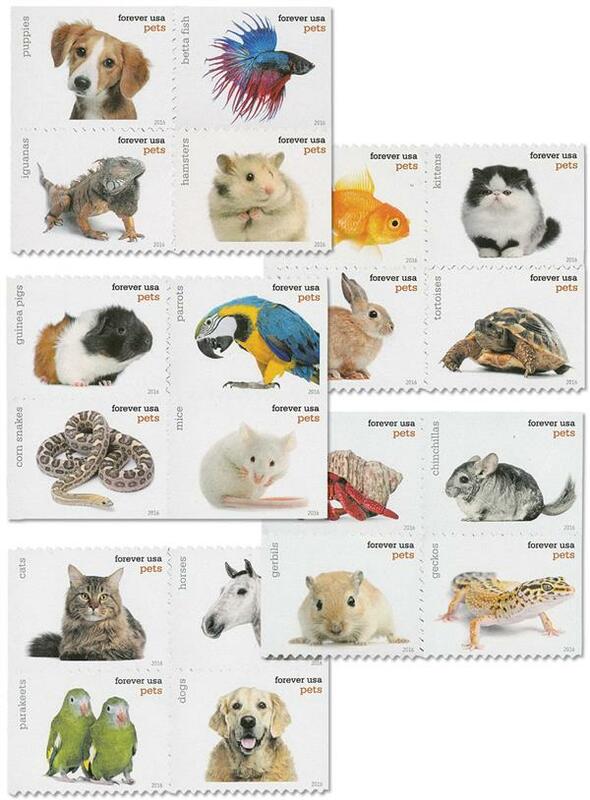 Click here for more animal stamps. Click here for more from the ASPCA website. 3 Responses to "This Day in History… April 10, 1866"
Green-wood cemetery. It has sculpture reliefs depicting his devotion to the humane treatment of animals. One can look it up on line. As a footnote the cable Carson San Francisco were created by a man who abhottrfthe treatment of horses pulling wagons loaded with people up the hills of San Francisco. Prevention of cruelty to animals is simply the right thing to do. They are our responsibility.